For the past six years I’ve been attending GenCon in Indianapolis in the summer and a couple of those years have been via a press pass, this year being no different. While there isn’t much in the way of a video game presence at GenCon, there’s usually at least a couple of booths that has something that I can use to write about. That also means getting several emails prior to the convention from publishers offering interview opportunities, though since we normally do video games on this site I have to turn quite a few down, though there is the rare one that is video game related. This year though I got a first: an email from a publisher to review something that’s not video game related. We have done a few articles in the past on Magic: the Gathering so there is a precedent for something like this. It also doesn’t hurt that the product is an expansion to a game which I do own and enjoy. 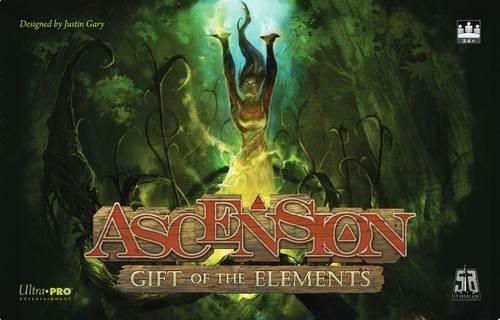 That being said, today I take a look at the latest expansion to the Ascension deck building game: Gift of the Elements. For those who have never played a deck building game, here’s a quick crash course. Deck Building Games will normally have each player start out with their own small decks of the same ten cards. These ten cards will typically represent various resources that are used to “purchase” cards in the main deck. These cards will then go into your discard pile to be shuffled into your deck once it runs out, allowing you to play it once it gets back into your hand. This keeps going with the players taking turns until the goal of the game is met which is different for each game. Some have you trying to defeat your opponent outright while others have you scoring a certain amount of points. As for Ascension, players will start with a deck of eight Apprentices and two Militias. There will also be six cards flipped over from the main deck to form the Center Row. Apprentices generate runes used to purchase cards from the center row which then go into your discard pile, while Militia generate power used to defeat monsters in the center row. Any time a card is removed from the center row it is replaced by a new one from the top of the main deck. Each turn the current player will play any cards he wishes from his hand, decide if he wants to purchase any cards from the center row or defeat any monsters, then once he is done or has nothing else to do, his turn ends, any cards he played goes into his discard pile, and he draws a new hand of five cards. If the player’s deck runs out of cards and he has to draw more, he’ll take his discard pile and shuffle it to form his new deck. As for how to win, the goal is to have the most amount of honor when the honor pool runs out of tokens. The tokens can be any small item like beads or coins and can represent any amount you wish, but you’ll start out with an amount of tokens in the pool equal to the number of players times thirty, so for a two player game for instance you’ll start with sixty honor tokens, after which you should keep some extra tokens aside. Any time a player earns honor they’ll take it from the honor pool until it is empty. Once the honor pool empties out, that signals the game is almost over. Play will then continue until whoever took their first turn last finishes they’re next turn, meaning everyone will get an equal amount of turns. Until that point you can still earn honor, but you’ll just take it out of the extra tokens you set aside earlier. Once the game is over, everyone adds up the number of honor tokens they have, then totals up the honor point total on all of the cards they have in play, their hand, their deck, and their discard pile. Add those two numbers together and you’ll have your final total and the highest total wins. That’s essentially a crash course on how to play Ascension. There’s quite a bit more to it, but that could be an entire review on its own. Now that we’ve taken a crash course on the game itself, let’s look at the mechanics returning and introduced in Gift of the Elements. The two returning mechanics are Events and Transformed cards. Events are special cards that when flipped from the main deck they do not go into the center row. Instead they go into a special place on the board for Event cards and stay there until something specifically removes it or another Event comes into play, in which the original Event will go to the Void. Events have a special effect that affects all players. 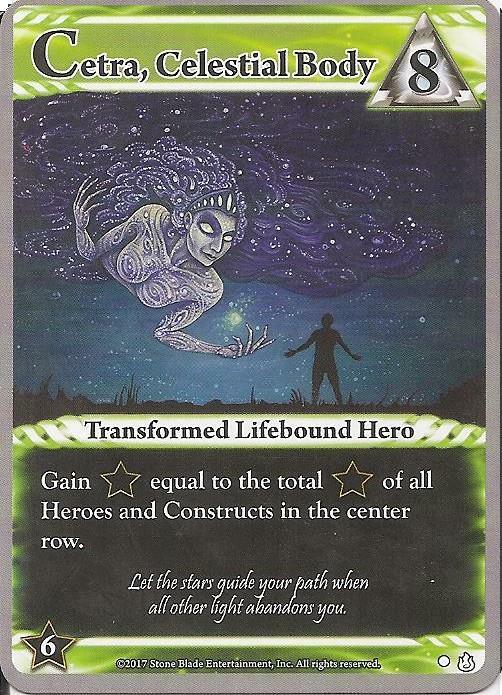 As for Transformed cards, these are normally cards that you can acquire and then pay a certain cost once in play to transform them for the rest of the game into something more powerful. I saw “normally” because when going through the cards in this set, the only Transform cards I found are the Events I just mentioned. In the past there have been separate Event and Transform cards, but in this expansion they’re one in the same. That means the Event cards have a transform cost that either player may pay on their turn to transform the event into a hero to add to their deck. As for the two new mechanics, they also kind of go hand in hand. The first is Infest which is found on some monsters. Normally when you defeat a monster in the center row they go straight into the Void. However, when you defeat a monster with Infest you not only gain the honor reward on the card, but you can then put it into your opponent’s discard pile. So what happens when someone draws a monster card? Absolutely nothing. It does nothing while in their hand and nothing while in play. By infesting your opponent’s deck with a monster card you’re essentially screwing with them by giving them a useless card to draw during one of their turns…well, mostly useless but I’ll touch on that in a moment. 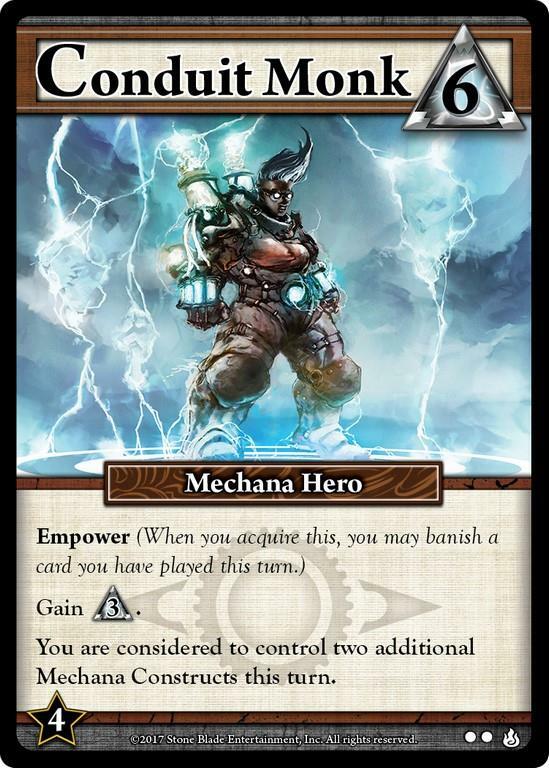 However, they’re not completely screwed as this is where the other new mechanic comes in: Empower. A card in the center row with Empower lets you banish (send to the void) a card that you played that turn. This is good for two reasons. First it lets you remove those pesky monster cards your opponent stuck in your deck. Second, it helps thin your deck a bit so you can get rid of your Apprentices and Militias to get to your more powerful cards quicker. There are other cards that let you banish something, but usually not something you just played. Since Empower is optional, you might not want to use it on more powerful cards since you’ll total up your honor on each of your cards at the end of the game. The mechanics introduced and brought back for Gift of the Elements are nice and I do have a couple of comments on them. The first comes with the Events and Transform cards: there are only a few in the deck. I mentioned that the couple of past expansions with these cards have had them separate while here they’re one in the same making this “comeback” of sorts kind of lacking. Granted the main deck is just over one hundred cards so the low amount of Events make sure that Events aren’t changing every few turns. However, it would have been nice if there were a few more transform cards that weren’t Events or a couple of Events that weren’t transform cards so one could experience one mechanic without having to wait for the other to show up. 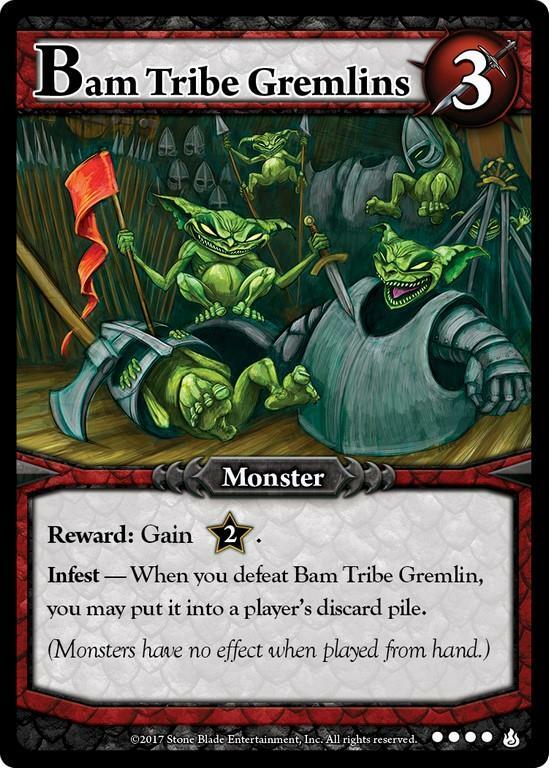 On the flip side, I love the concept of Infest and Empower and looking through more of the cards in the deck I’ve found some interesting ones such as the Mechana Construct “Cell Block E” which lets you put a monster in play as a Mechana Contstruct when played from your hand or acquired from the center row (Constructs are cards you can play that go to a special area on your side of the board and stay there until something removes them). So why would you do that when monsters are useless when in play? Because of another Mechana Construct called “P.R.I.M.E. Directive” which states you win the game outright if you control eight Mechana Constructs. Basically if you acquire this very expensive Construct (cost of eight runes) and “Cell Block E” you basically just blocked your opponent from infesting your deck with monsters as it’d actually be helping you. 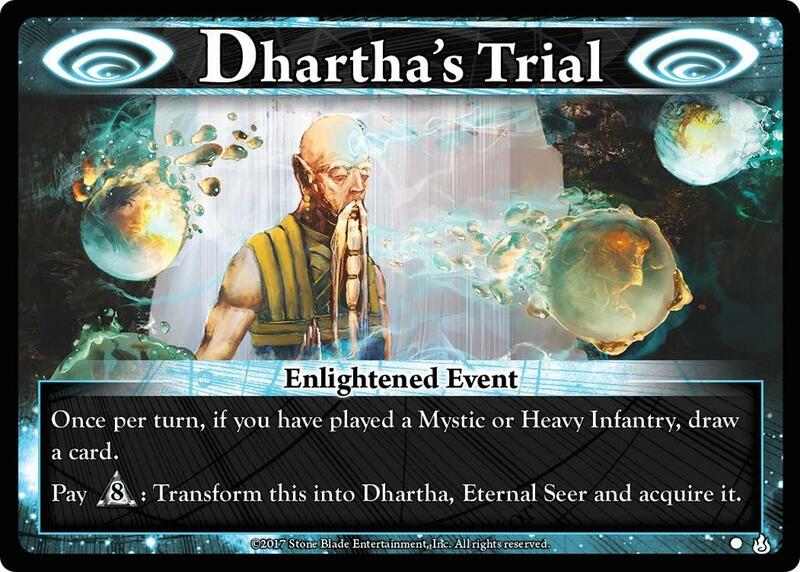 A lot of Ascension is strategy and learning how various cards work together, especially those of the same faction (Mechana, Void, Lifebound, and Enlightened). Overall, Gift of the Elements is a pretty good set. I recently brought the game over to a friend’s house and we did a three player game with neither of the other two ever having played it, one of which had never played a DBG at all. Needless to say they both enjoyed it as did I. I also like how the game can be played on its own without the need for another set as anyone can pick it up and play it without needing the core set of cards. If I had to make one suggestion it would have been to add a few more events and transform cards, and not to make them one in the same (have a few of each in other words). 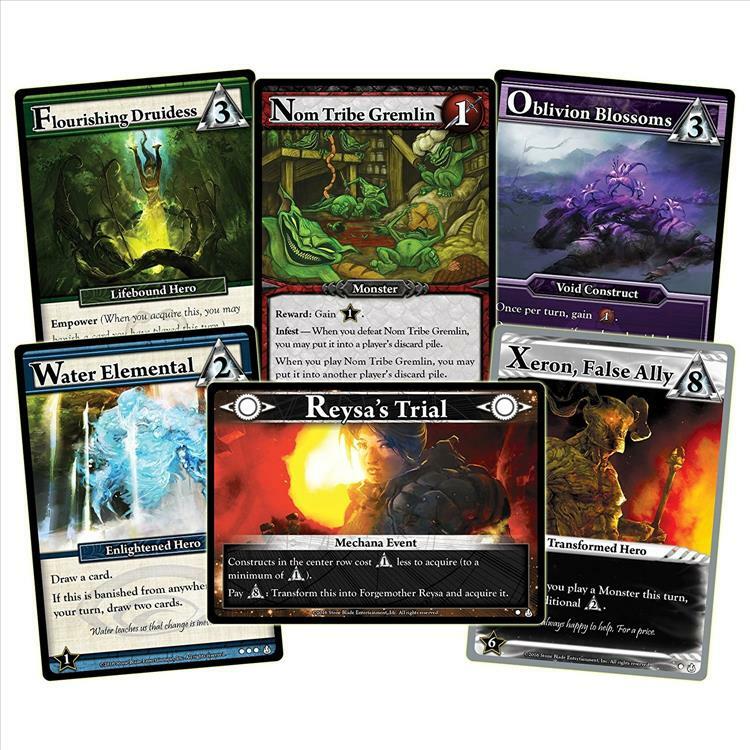 As of now this set isn’t in the digital versions of the game, but beyond that Ascension: Gift of the Elements is an enjoyable addition to an already enjoyable deck building game and I’m looking forward to future sets.